Pep Guardiola admits even he is unsure how to juggle the demands of challenging in four competitions. Guardiola's Manchester City are enjoying a remarkable season, sitting with a 13-point lead at the top of the Premier League - with a game in hand - and having eased into the last 16 of the Champions League. They also face Bristol City in the Carabao Cup semi-finals in January after beginning their challenge in the FA Cup at home to Burnley next weekend. Guardiola has proved throughout his career he can deliver, having won 21 trophies during his spells in charge of Barcelona and Bayern Munich, but this situation is a new test for him. The City boss said: "I am worried about that. Four competitions - I don't know if we will be able to do that. "The schedule - you have to be careful. I am worried because we cannot play every three days. "We cannot play Kevin De Bruyne every three days 80 minutes, 80 minutes. He needs to be refreshed to help in the last part of the season. "I have never before been in this situation. Three competitions I have handled many times, but four never. And the fourth is double games (two legs), and extra time. We are going to see how we handle that situation." 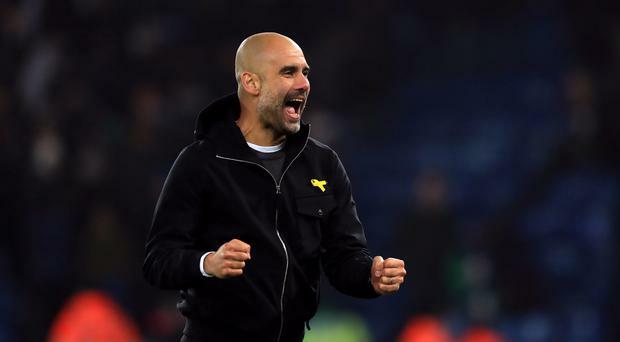 In City's favour, however, is not only the form that has seen them lose just one of 29 games in all competitions, but a team spirit as good as anything Guardiola has experienced elsewhere. The squad's togetherness was in evidence after City's recent derby victory over Manchester United, their late winner against Southampton last month and the Carabao Cup penalty shootout success at Leicester. Guardiola says these celebrations are only part of the story, however. Asked if the spirit compared favourably to Barca and Bayern, Guardiola said: "Definitely, and not just the team - the staff. "Every day I say thank you for my physios and doctors - people like that. They are involved. They support, encourage the players and we all move forward. I cannot do it alone. They help me. "The team spirit, people speak about how we celebrate the goals, that is simple to see but that is not the real situation where it happens. The real situations are how the players who are not playing celebrate, how they are warming up, how they are on the bench, in the locker room, every day, not just after the games. "You can ask other managers when they have success, when they win titles. Always they have in common the group is strong. Not 11 players, the group. "Everybody wants to win, everybody dreams to do that. When that happens everything can happen." City face Crystal Palace at Selhurst Park on New year's Eve bidding to win their 19th Premier League game in succession.